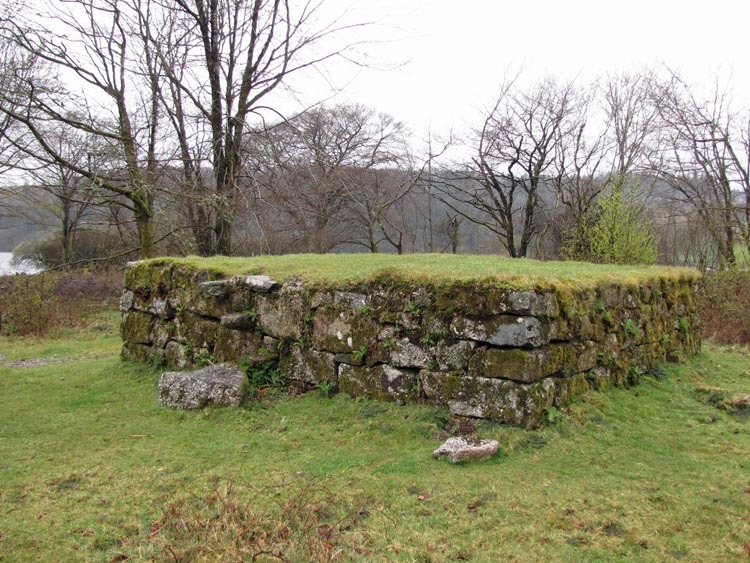 Location: On the banks of the Burrator Reservoir, behind the remains of the Longstone Manor House. Purpose: Socket stone for a wayside cross. Size: The socket stone measures 29 inches (0.74 metres) wide, 16 inches (0.41 metres) high and with its depth tapering from 27 inches (0.69 metres) down to 15 inches (0.38 metres). The size of the socket, that would have held the base of the cross, is 8 inches (0.20 metres) square by 6 inches (0.15 metres) deep. 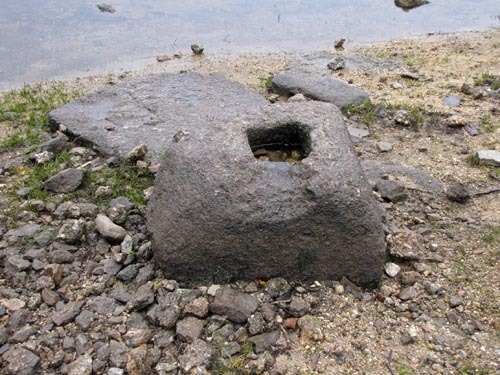 Information: It is thought that this socket stone was once used to support the Lowery Cross on the other side of the reservoir, at Grid Reference: SX/555/692. Although the cross has now disappeared, the socket stone was probably brought across to Longstone Manor for safekeeping. It seems as though the site of Longstone Manor was owned from at least the 13th century by Herbert de Cumba, Lord of the Manor of Sheepstor. By the 15th century the Scudamore family owned the lands at Longstone before they passed it on to the Elfords, when John Alford married Johanna Scudmore. Much of the present building was re-built for Walter and Barbara Elford in 1633, according to a date stone removed from the ruins, possibly taking in elements of the earlier house. A mid 18th century map shows the main house to the north, and outbuildings and a walled garden to the south (this area is now under the reservoir waterline). Longstone ceased to be a Manor House in 1748 and passed out of the Elford family. It is recorded as being in the ownership of William Smith in 1750, by which time the property had been downgraded to a farmhouse. The farm was then passed down through two subsequent generations before it was sold to Sir Massey Lopes in 1811, who removed the attached west wing and courtyard, blocked the windows and replaced them with sashes. It was later tenanted until 1897, with the last tenant being Mr George Creber. As a consequence of the construction of Burrator Reservoir, which had begun in 1893, the farm was abandoned in 1898 when the valley adjacent to the site was flooded to create the Burrator Reservoir, during which part of the estate was also flooded and the main house abandoned. The house was noted as being in good repair at this time. However, after the site was abandoned the roof was removed. The reservoir was expanded between 1923 and 1928, at which time the remains of the outbuildings to the south of the main house were submerged. 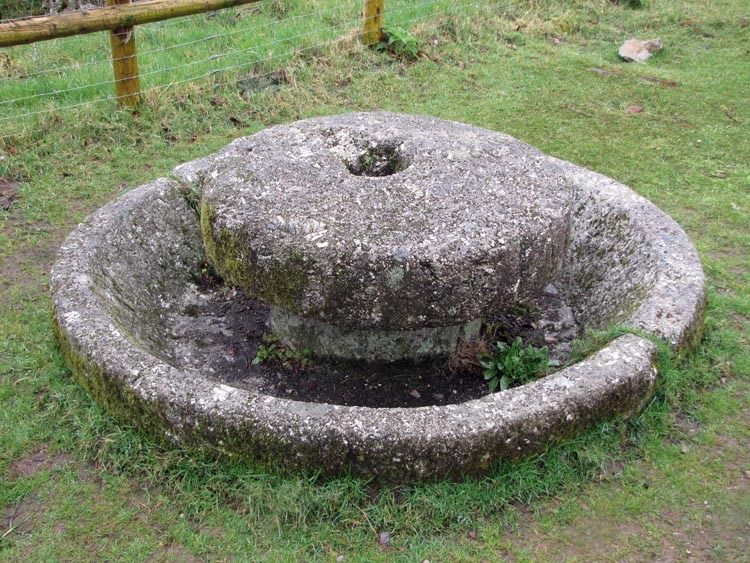 In the early 20th century several granite artefacts were recovered from Longstone Manor for safekeeping. 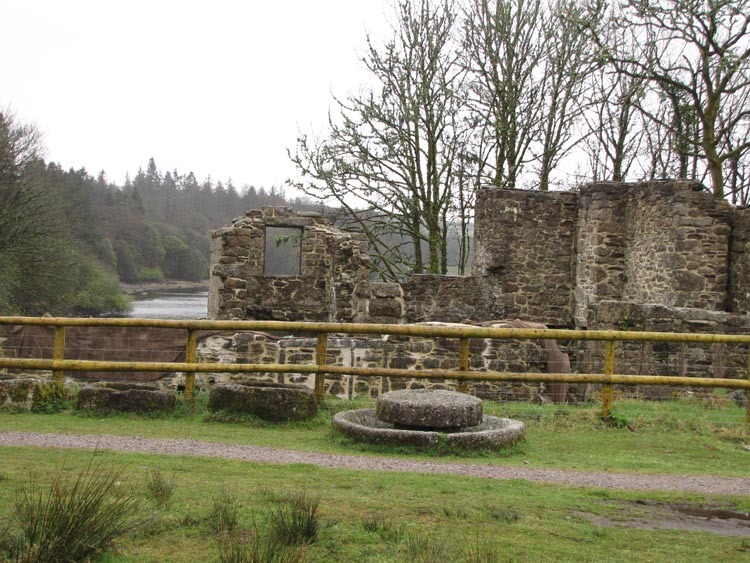 These include the date-stones of the house (1633) and windstrew, some doorways and a stone lectern, all of which were re-sited in Wembley Walk, situated near the Burrator Discovery Centre on the other side of the reservoir. Other items that have been recorded at Longstone Manor, but which have now disappeared, include two mould stones, a mortar stone, a granite feeding chute and a holed gate hanger stone. Since the building was abandoned most of the east end stone walls were robbed out and much of the ashlar facing was removed, with the exception of that on the south elevation. In 1999 an archaeological recording survey was carried out on both the remains of Longstone Manor house and the associated structures below the waterline, at which point the water line was low enough to survey and record the masonry walls. A midden to the west of the house has produced tiles and post-medieval pottery sherds, and the archaeological investigations of the submerged buildings have uncovered medieval as well as post medieval pottery. These finds, in conjunction with earlier reused masonry in the house and a fragment of medieval arch identified within the wall of the sunken pathway, support the likelihood that there has been an earlier occupation of this site. Work to consolidate the masonry remains of the main house were carried out in the late 20th century, including supporting the window openings, gateway and the chimneypiece in the west wall. John Elford, is understood to have built the Windstrew (threshing platform), to the north-west of the family farm, around 1640 and one of the granite steps up to the Windstrew bears the inscription 'J. E. 1640'. The Windstrew must have suffered from dilapidation over the years as it was partially rebuilt in 1800. At harvest time, the sheaves of corn were threshed by hand on the Windstrew and the breeze flowing over the raised platform would blow away the chaff leaving the grain to be scooped up and stored for future use. Evidence of cider making at the manor is provided by the apple mill which sits beside the fence around the manor buildings. This would have been used to crush the apples into a pulp prior to them being put into the press to have the juice extracted. The cider house was predominately made from timber, as was the press, and both have now disappeared over the years. 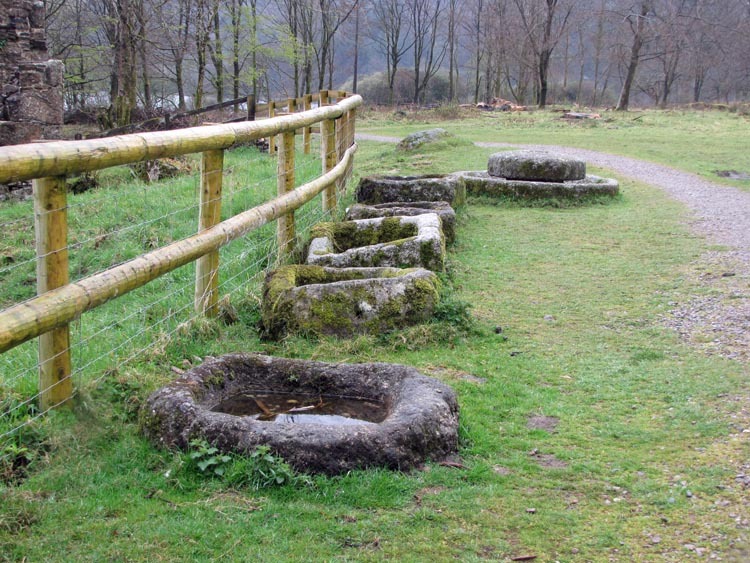 There are also a number of granite troughs scattered around the site, five of which are lined up alongside the fence with the apple mill. Our thanks to Robert Noakes for bringing this socket stone to our attention.